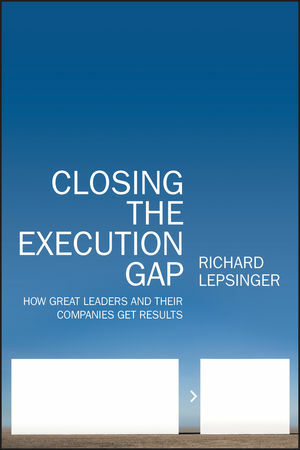 "Closing the Execution Gap has excellent information and insights that are well connected to meaningful bodies of research. Lepsinger hones in on tangible, real-world problems that many leaders will recognize and then offers practical solutions. ?Line managers and Learning and Development professionals will find this book of interest because it captures the critical concepts that make an organization and its people successful." Craig DinsellEVP and Head of Human Resources, Oppenheimer Funds, Inc.
Richard Lepsinger is president of OnPoint Consulting and has a twenty-five year track record of success as an organizational consultant and executive. He is the coauthor of three books on leadership including Flexible Leadership: Creating Value by Balancing Multiple Challenges and Choices, The Art and Science of 360? Feedback, and The Art and Science of Competency Models, all published by Jossey-Bass/Pfeiffer. List of Figures and Tables. Chapter One: Vision Without Execution Is Hallucination. Yes, There Is an Execution Gap?But That's Only the Tip of the Iceberg! ?Conventional Wisdom? : Maybe Not So Wise! The Five Bridges: Gap Closers That Make the Difference. Chapter Two: Bridge Builder 1: Create and Use Action Plans. First Things First: A Brief Look at Strategic Planning. Vision and Standards of Excellence. Aligning Projects and Programs with Strategy. Action Planning: An Execution Essential. Chapter Three: Bridge Builder 2: Expect Top Performance. The Pygmalion Effect: Proof That Expectations Drive Performance. Chapter Four: Bridge Builder 3: Hold People Accountable. Why We Should Hold People Accountable?and Why We Don't. Assessing Accountability: The Four Levels. Accountability Boosters: Managing Accountability in Others. Chapter Five: Bridge Builder 4: Involve the Right People in Making the Right Decisions. Beyond the Buzzword: What ?Empowerment? Really Means. Brain Basics: How Cognitive Systems Impact Judgment and Decision Making. So How Can We Make Better Decisions? Chapter Six: Bridge Builder 5: Facilitate Change Readiness. Kicking Old Habits: What Addicts Can Teach Us About Change. The Five Levels of Change Readiness. Moving on Up: Facilitating Change with Level-Appropriate Strategies. Holding Up the Mirror: Understanding the Impact of Leader Behavior. The Importance of Change Talk. Chapter Seven: Bridge Builder 6: Increase Cooperation and Collaboration. Cooperating Versus Competing: The Human Struggle. Disagreement Happens: How to Gain Support and Resolve Conflict. Conclusion: Five Lessons for Leaders. Lesson 1: Integrate the Leader and Manager Role. Lesson 2: Clarify Assumptions and Priorities. Lesson 3: Make Sure the Right Systems Are in Place. Lesson 4: Coordinate and Monitor High-Impact Actions. Lesson 5: Get Change Management Right. Appendix: Criteria for Selecting Top-Performing Companies.